Gunung Nuang Ultra 2017 | JustRunLah! Mount Nuang (Malay: Gunung Nuang) is located in Malaysia with the height of 1,493 metres (4,898 ft). Its peak borders Pahang & Selangor state. The mountain itself is the highest point in Selangor and part of the Titiwangsa Mountains. For Gunung Nuang Ultra Challenge course not going to the peak, we cover the 1st half of the rover trail which is start 70m sea level to 500m altitude point and return to the start/finish point. 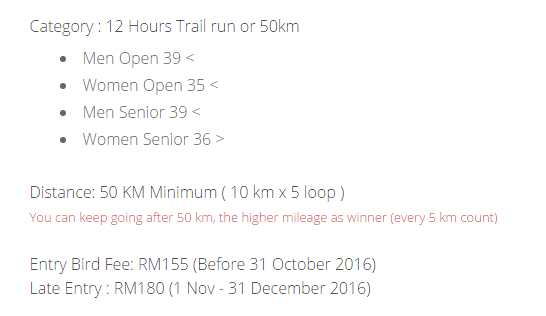 every loop take 10km with 530m elevation gain, Complete minimum 50km or more in 12 hours to entitle a finisher medal which is 50km 2600m+ gain , 10km loop x 5. The highest mileage clocked as winner .